Fiber has been flying in the House of Whit. I have 1.5 Anastasia Socks completed. Why only 1.5 you may ask? I ran out of yarn…#rookiemistake. This really annoys me. 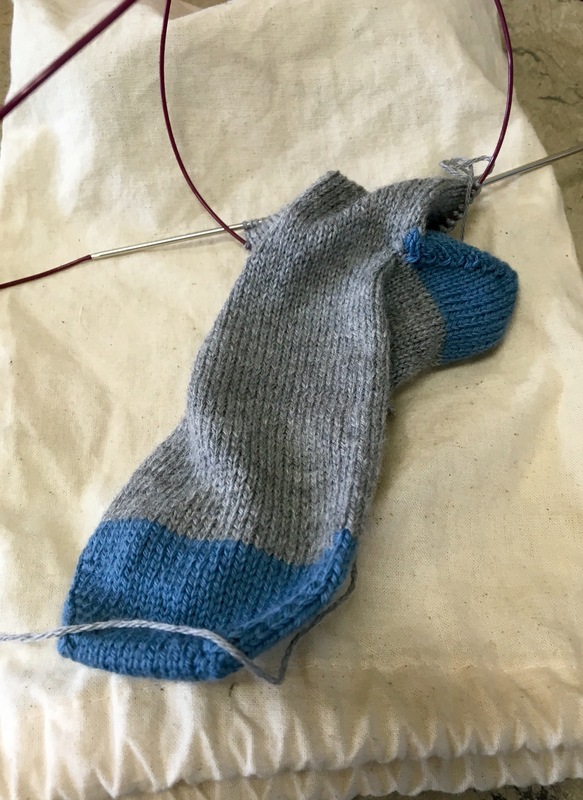 I recently made a pair of socks with the same yarn and gauge and had more than enough left over. Guess I will need to buy another skein only to use ~ 1/4 of it.😒 I guess there are bigger problems in the world. In the mean time, I started another pair socks. I am using up the scraps of my Valley Yarn Huntington in Sea Gull and Bluestone. The toes, heels, and cuffs will be accented in the Bluestone. Last, but not least, I am plugging away at my crochet blanket. I have decided it will be a gift for my grandfather’s birthday. One in hibernation, one on the needles, and one on the hook. Not a bad line up for the week. What are you making this Wednesday?